"functionless art is simply tolerated vandalism". "Never mistake lack of talent for Genius"
Just a bit of an update for ya. Gavin and i had a very insightful meeting with John Tacons loverly sister yesterday as she is interested in how we are getting on with the case of ZK-AJV. Pamela who was only ten years old when her brother John went missing spoke of her memories of the time leading up to the mystery of her brothers dissapearance. She spoke of the good times people were enjoying after the end of WW2 and the general feeling that a bright future lay ahead for all. She obviously loved and looked up to her brother. Her memory was very clear and she talked about the weather on that day 7th june 47 as her family travelled through to Taupo from Napier on a Bus to meet with John and others for lunch. She talked of the rain on the day and how none of the family had believed that John would attempt the flight in those conditions. so they were not alarmed at first when they got to taupo to find John had not arrived as they simply thought well he's just not coming the weather is to bad. 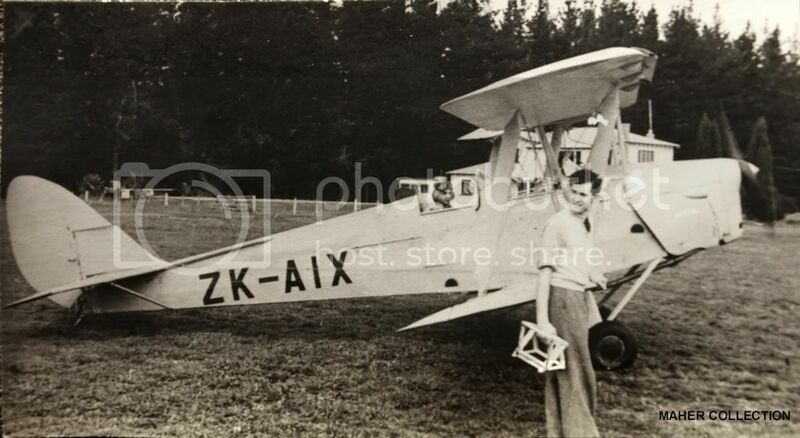 I feel this puts the sighting of a Tiger moth thought to be ZK-AJV near lake Tawarera later that day in some doubt as for this to be correct it would mean John made it all the way over the Urewera's in appauling conditions of low cloud and drizzle. The mystery remains? ? Can i ask if any of you have any old Photos of ZK-AJV or NZ895 as it was in RNZAF service PLEASE post them here on proboards as the only photo I've ever seen of it was in the Chris Rudge book MISSING ? Great book by the way.....cheers. Last Edit: Jun 5, 2012 17:48:13 GMT 12 by Gary. Sounds great, looking forward to hearing developments. Taken after 17th April 1946, which is the date ZK-AIX got its CofA issue. Would that be normal seeing slats and anti-spin strakes on a Tiger in those days ? A warmish day so perhaps the summer of '46/'47 then. If John was sitting any lower in the cockpit he would need a periscope to see where he was going. Yes you're on to it DragonflyDH60 John was only 4ft 11 tall we have talked about how being that short and flying a blind forward aircraft like a Tiger moth may have been difficult for john to see where he was heading. Mort Vanderpump later went topdressing and was killed. His company, Vanair, survived for many years under several different owners. 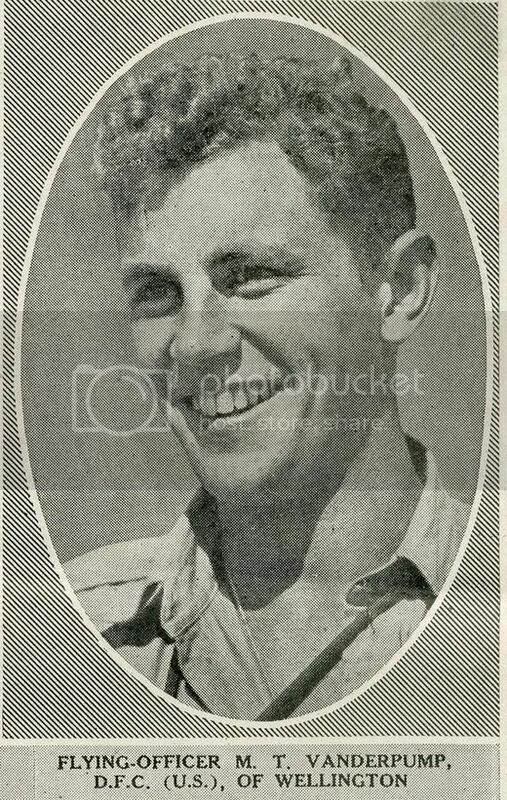 If it is really important to identify this chap, I have a suggestion - I can remember reading a Leo White interview with Mort in a really early Whites Aviation magazine, probably one from the late 1940s. If you could track that down (I know that MoTAT have a set) there may be a photo included that could help. I'd say it probably is Mort, comparing the two photos. There was someone on here recently discussing Mort and although they didn't say they were related, their User Name included the initials "vdp"? Can't find the thread though. The other topdresser that lost a prop blade was a C180, BGN, at Putorino, Apr 55. The pilot was Mort Vanderpump, he was killed. Goose Erceg was certainly a lucky fellow to walk away from the incident when he lost a prop blade, and the engine. I haven't seen an accident report but I believe the crankshaft of BGN broke, so I guess the prop could have let go? ZK-BST was the other Cessna 180 the blade came off,crashed 22 Nov 1961 near Te Kuiti,killing the pilot,Northern Air Services were the operator. Does anyone know the US website someone put up a while ago that has most of the NZ accident reports in full on it?. It seems they had a few of them in a short timeframe then. I have actually heard Goose relate his story, in an aeroclub bar, but I did not realise it was 20 years after the event. Given it was a Sunday nighter, 20 years afterwards, and now over 30 years since the drinks I could not hope to give an accurate account. My version of events has Goose hearing a bang and instinctively going for the throttle. He got his hand to it just as the knob departed through the panel, the broken finger being the only injury he sustained when he stepped out of the wreckage a few minutes later. In the vicinity of New Plymouth, New Zealand, in March 1958 a Cessna C-180, ZK-BQJ engaged in aerial topdressing suffered a propeller failure which threw one blade. The resultant imbalance then threw the engine completely out of the airframe almost instantly. As it departed the engine forced the top cowling over the windscreen, and also impacted the starboard main-wheel, cutting the tyre. The moment the engine came off the Cessna was thrown into a vertical snap roll, so rapidly that the pilot’s crash helmet was cracked when hitting the windscreen pillar! Then followed a flat spin, from which normal spin recovery was successful. To counter the pitch-up resulting from the rearward c of g change, the pilot applied full forward elevator, and lowered the flaps. The ensuing flight path was controllable sufficiently to affect a successful force landing, with no further damage to the aircraft. The free flying engine impacted in the farmer’s wood pile with no other damage to any person or property, but gave the farmer’s wife a severe fright as she hung out washing. After a calming cup of tea, the pilot checked in with his operating company and reported that he needed a replacement aircraft, and when asked why, responded that the engine was missing. They took him at his word and duly arrived in a replacement aircraft, complete with engineer ready to replace plugs etc! The pilot became a legend in New Zealand agricultural aviation circles and managed to successfully complete in excess of 25,000 hours topdressing time. Sadly he passed away a few years ago in retirement. Red Baron, it was the Embry Riddell site but although I looked at it then, I can't find it now, neither can I find the post that referred to it. It didn't have them all, but there was some good old stuff on there. I had forgotten about BST, and that fits except that from memory Jan Smoes was Swiss, not Dutch.